The SUNS U18 Male Academy sit on top of the ladder after Round 4 of the NAB League Series, defeating Oakleigh Chargers by 71-points on Sunday. The win leaves only the SUNS and interstate rivals Sydney unbeaten to date. After a low scoring and tight first quarter, Gold Coast kicked 13 goals as they got on top of Oakleigh around the contest. 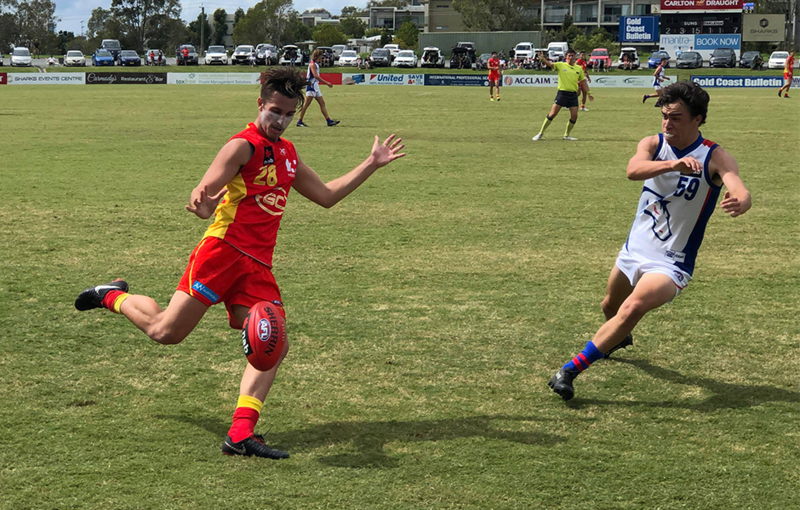 In an impressive sign of endurance and cohesion, the in form SUNS held the Chargers to only two points in the last quarter in a dominant display at Southport. It was an impressive team performance from the Gold Coast team, who showed great composure across all areas of the ground. Tackling pressure was a noticeable strength for the red and gold, who lay over 70 tackles for the game, while efficiency entering the forward 50 played a key role to the SUNS ability to hit the scoreboard. Skipper Connor Budarick was instrumental in the win, with 16 tackles and 28 disposals. Fellow midfielder Matthew Fraser notched up 10 tackles, while Ashton Crossley was also a notable mention with 25 disposals. Defender Corey Joyce had his best game for the season, racking up 24 disposals and played a pivotal role off half back with five rebound 50s, linking up well with 2019 draft prospect Ace Hewago Oea, who leads the competition for inside 50s after having eight on Sunday. On the victory, Oea said specific pre-season training focussing on endurance and skill helped when coming up against TAC Cup sides. “Yeah it was a good win. We’ve been training hard and were pushed to be able to play against these Victorian sides so it was nice to play our style of game and get the job done”, he said. Oea was humble on his role in the team, however attributed the forwards ability to create turnovers as an influence on the game. “I was just in a small forward role but it was good to put the press on and create the upset to give it to the big fellas to kick the goals,” he said. The win came much to the delight of head coach Andrew Raines, who said while Oakleigh had a depleted side, to be able to win against a high quality Victorian team was pleasing. “We spoke before the game that nine or ten Victorian players are easily replaced, given the quality of football down there, so it was a challenge…but our manic pressure set the tone early and we were able to gather the ball and get it inside 50 fairly quick”, he said. The SUNS Academy now have a week off over Easter to recuperate before heading to Melbourne to play another TAC Cup side in the Eastern Ranges.